Choosing the best smartphone can be a daunting task to the uninitiated and expert alike. This is particularly true given the attractive specs and polished features found in most of these devices. 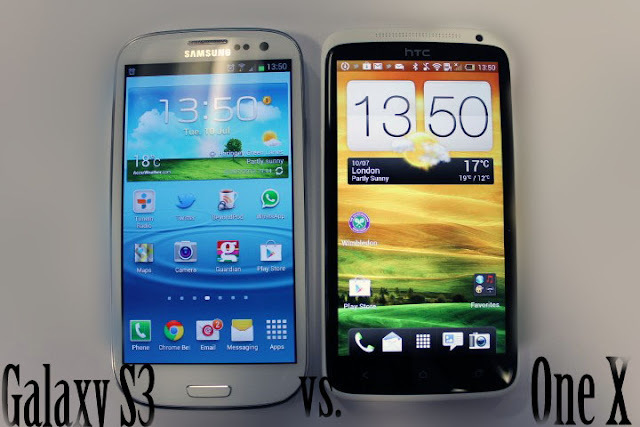 The HTC One X and Samsung Galaxy SIII illustrate this dilemma and a simple comparison between them should help to clear your mind off any doubts and allow you to decide on your ideal smartphone. Both devices come with Android 4.0, and embrace a comparable 8-megapixel imager that can simultaneously record a video and take still shots. A recording of 1080p is also possible. Equally they tender a combination of connectivity choices such as Bluetooth 4.0, HSPA, WiFi hotspot, Near Field Communication (NFC), Wi-Fi, and Wi-Fi Direct. The screens of both gadgets have the same resolution of 720 x 1280 pixels and are both protected by the strong, damage-resistant Corning Gorilla Glass. Apart from running Android, HTC One X also is complemented with HTC Sense 4. Sense user interface superimposes Android with numerous features, making it a lot more sophisticated than the untreated Android. In contrast, the Samsung Galaxy S III utilises some pretty complex technology to the delight of many gadget enthusiasts. S Voice, an intelligent personal assistant like Apple's Siri voice recognition application is one such technology. Direct Call switches between voice calling and messaging dependent upon placing the phone next to one's ear. It then flaunts Smart Stay using the front camera to verify if you're still viewing the screen and consequently adjusting the screen brightness. The HTC is a flagship product and lives up to its reputation. Although being a sizable phone, it gives the sensation of being slim at 8.9mm. You can obtain them in traditional black and white colours. On the other hand the Samsung Galaxy S III is a little trimmer than the HTC and shows off a more rounded design. Weighing 130 grams, the HTC One X is somewhat lighter than the 133-gram Samsung Galaxy S3 which comes with the choice of white and blue. Many customers see a great advantage in the HTC One X for its stain-resistant coating that facilitates cleaning of dirt and stains. In addition, they believe that the HTC One X wins with regard to a finer feel. Both of these phones are outstanding flagship devices with the Galaxy S3 having a slightly lower price. Choosing one will almost always satisfy the customer, however the interested individual should closely look at the features they both provide and see how those fit in with your preference or lifestyle.